Much as I'm pleased to see Windows Explorer finally getting a prominent spot on the taskbar in Windows 7, I'm a little disappointed that it opens to the Libraries folders by default. That's rarely the area I'm after when I open Explorer. 1. Right-click the Explorer icon on the taskbar, then right-click Windows Explorer and choose Properties. 2. In the Target field, simply tack on the path to the folder you want. In my example (below), I've pointed to c:\Data. 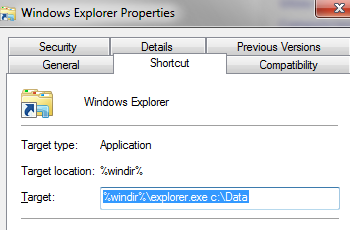 Just make sure you leave a space between %windir%/explorer.exe and your folder path. Now, when you click that taskbar Explorer icon, Windows Explorer will open right to your folder of choice. Nice!